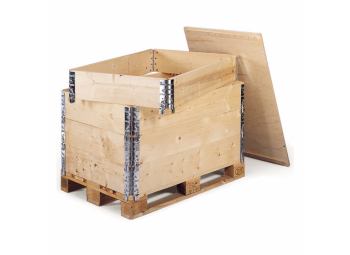 Associated Pallets Ltd always carry a large stock of heat treated – wooden pallets, pallet collars, pallet boxes and timber, pre-heat treated, ready for immediate next day delivery throughout the UK. We can also heat treat your wood packaging if required small or large shipments can be heat treated, collection and delivery back to your premises can be arranged. As a member of Timcon, Associated Pallets Ltd adhere to strict quality control and comply with the UK WPMMP-HT programme. Our Heat treatment kiln is subject to six monthly inspections to ensure satisfactory compliance. All wooden products supplied by Associated Pallets will be accompanied with a heat treatment certificate, our company registration and a graph showing the treatment process, this gives you complete confidence there will be no problems with your exports. Did you know that over 90% of pallets and skids used for transporting goods in the world are made from wood. Due to the volume of wooden packaging being shipped across borders, there is an internationally agreed check to make sure there are no nasty bugs hiding in the timber which could cause devastation in vulnerable countries. The packaging standard that protects the world’s forests from disease is called the International Standard for Phytosanitary Measures no. 15 (ISPM15). Every piece of wooden packaging that is treated is stamped with an internationally recognised mark to prove the packaging item has been treated to the ISPM15 standard. This mark essentially acts as a passport for the packaging item allowing it to be confidently transported across international borders with the knowledge it does not contain wood-borne pests.